Grosjean suffered a tumultuous start to 2018, failing to score a point in the first eight races, but has climbed from 19th in the drivers' standings to 14th with three top 10 finishes in the last four grands prix before the summer break. His teammate Kevin Magnussen has scored 45 points across the season with what is the strongest car Haas has produced in its first three years in F1. 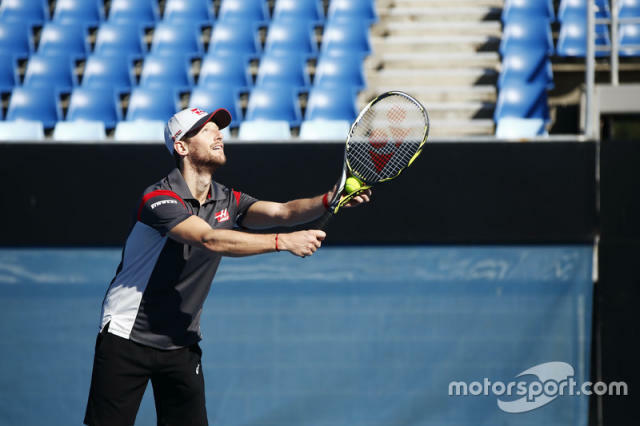 Grosjean said his dip in form is no different to former world tennis number one Djokovic slipping to 21st in the ATP world rankings, before returning to the top 10 and winning Wimbledon in July – his first grand slam success in two years. "It's been tough," Grosjean told Motorsport.com. "I think it's just getting yourself back to where you believe you belong and what you know to do and there are various reasons in life where sometimes you are going through a tougher patch. "Look at Djokovic, he's number one in the world and then two years completely off and now he's won Wimbledon again, it's great to see. "And he hasn't lost his tennis [ability], he hasn't lost his fitness, he was just different. Sometimes you are. "I have had some bad luck, some bad moments and then some more bad luck, and it was just hard to get back." In the first eight races, Grosjean lost several potential points hauls to accidents. In Baku, he was sixth behind the safety car when he lost control while heating his tyres and hit the wall. At the start of the next race in Spain he spun on the opening lap at the Turn 3 long right-hander and collected two cars in the process. A first-lap clash with Magnussen compromised both drivers races in Britain a few races later, as did a move on Esteban Ocon at the start of the French GP. Misfortune outside of his control has also cost Grosjean, particularly an unsafe release that cost him a potential fourth place finish in Australia and an engine problem at the start of qualifying in Canada. "This year didn't start well and didn't go well after that and I did struggle to recover my form," he said. "But, it was just that it was a lot together. "Sometimes things don't go your way, sometimes the feeling is not what it should be. Sometimes you just need to put yourself back together and get back to it." Grosjean said his rise from 12th to sixth in the closing stages of the German GP was a good example. "I hope I'm back to where I know what to do and if that is the case then things are just going to come my way, as they did in Hockenheim," he said.